Check out our Napa Valley Wine Tours! An enjoyable alternative to a private limo tour for a fraction of the cost. Build friendships with fellow wine tasting enthusiasts and create life-long memories. Dynamic Napa Wine Tours gives wine enthusiasts the luxury and service they expect from Beau Wine Tours without the additional cost of a private tasting tour. The daily wine tours experience is an affordable and wildly popular way to enjoy Napa Valley and its world famous wines. While on this “mixed-group” tour, you will meet new friends who share your passion for great wine as well as those curious about the wine tasting experience. You will learn about Napa’s eclectic local history and geography and see for yourself why visitors and locals alike are in love with the beauty that surrounds the Valley. Your full day of wine tasting begins when we pick you up from your Napa Valley hotel in one of our luxurious Mercedes Sprinter limousines. Enjoy a glass of complimentary champagne as you become acquainted with your fellow wine enthusiasts. Relax in the plush seats as your vehicle weaves its way through Napa’s extraordinary countryside and beautiful vineyards. 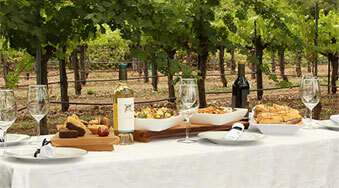 Dynamic Napa Wine Tours hires only the most knowledgeable and friendly tour guides. We will take your group to four exceptional Napa Valley wineries; from smaller family boutique wineries, to historic estates and iconic wine labels. Don’t forget your camera! You’ll have plenty of opportunities to capture Napa’s quaint and unique atmosphere. With its majestic scenery, exceptional art, and fascinating architecture, Napa Valley is sure to delight all who visit. Our Dynamic Napa Wine Tours are not only available to those staying in Napa Valley. If you’re staying in San Francisco and interested in joining one of our wine tours, it’s just a simple ferry ride away. Enjoy a breathtaking ferry ride from San Francisco’s Ferry Building to historic Vallejo. Your ride will include views of the beautiful Bay Bridge, Alcatraz Island, and Angel Island. If you’re lucky, you may even catch a glimpse of the infamous Golden Gate Bridge in the distance. Before your full day of wine tasting begins, enjoy a flaky pastry, Bloody Mary, or mimosa while aboard the ferry. Please arrive early to purchase your tickets! The ferry leaves promptly at 8:30am. Once you reach Vallejo, our tour guides will pick your party up for a beautiful, relaxing tour of the world famous Napa Valley. In addition to exceptional wine tasting, you’ll also enjoy a catered picnic lunch from one of wine country’s very own farm-to-table restaurants. Experience a delicious lunch served “family-style” at one of Napa’s many “hidden gem” locations throughout the valley. Whether it’s a vineyard view, garden terrace, or wine cellar, you will truly enjoy your “meal with a view”. With a variety of hearty sandwiches, salads, and desserts, the meal will satisfy the true foodie in you. After a full day of eating, drinking, and sightseeing, our driver will drop you and your party off at your hotel so you can continue enjoying everything that makes Napa Valley one of the most sought after locations in the world.